Coin collecting or numismatics is the collecting and studying of both coins and paper money. It can be a rewarding hobby and solid investment. Organizing and tracking your coin collection will help keep track of what coins you have and how well your investment in numismatics is performing. If you just inherited a coin collection you may be overwhelmed by the task you have in front of you. But perseverance and a logical approach cataloging your collection will help you ensure that you receive top dollar for the coin collection that you inherited. One of the characteristics that differentiate "coin collectors" from "coin accumulators" is that they are compelled to organize and catalog their coin collections. Keeping a written record in the form of a catalog is an essential aspect of coin collecting. It not only gives you the ability to see what you currently own but also the ability to chart your future coin collecting goals so that you acquire the necessary coins for your collection. A well kept and maintained catalog of your coin collection would benefit not only yourself but your heirs in the future. The Importance of cataloging your coin collection cannot be overemphasized. As one veteran coin collector once told me, "We are only stewards of these miniature works of art. We are not going to take them with us when we leave this earth, therefore we must preserve them for future generations." A properly cataloged coin collection will make it easier for your heirs to liquidate your coin collection if they do not want to keep it for themselves. You should enter the details of precisely what is contained in your collection, what you paid for it and perhaps what it's worth today. This will ensure that your heirs will not get ripped off when they go to sell your coin collection because they will have an idea of its approximate value. Moreover, there are legal implications too. The IRS requires records that support the purchase and sale information for each of your coins for tax purposes. When you or your heirs go to sell a coin, if the original purchase price or value is not recorded, then the IRS will assume that any amount over face value is profit and liable to be taxed. It is appropriate to record any coin received as a gift at the current market value for tax purposes. Although this article is not intended to be a source of tax advice, these guidelines will provide you and your heirs the information they will need regarding your coin collection in the future. 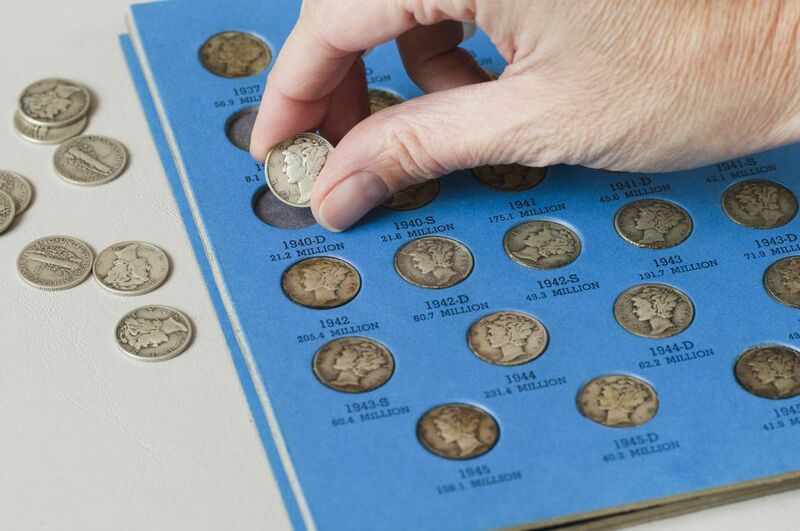 There are many different ways to catalog your coin collection. Some people choose to record their coin collection transactions on 3 x 5 cards stored in a cigar box. Others use sophisticated computer software that interfaces with coin collecting databases for valuation purposes. There is no single best way to catalog your collection. You should select whatever method provides you with the information you need and one that you are comfortable using. Listed below are some of the more common methodologies that people use to catalog their coin collections. Another way to catalog your coin collection while you simultaneously plan what coins you'd like to acquire next is to use a coin collecting checklist. Unlike a notebook, which is freeform and provides no initial information, checklists are organized by type, denomination, year and mint mark for each series of United States coins. Unfortunately, some of these do not contain the information that you would need to provide your heirs or the IRS when it comes time to sell your coins. This information should be added if your checklist does not provide an area to record this information. Whitman Publishing has the Official Red Book: Check List and Record Book of United States and Canadian Coins. Click on the "Compare Price" link below to find the lowest price or you can download one of the free versions listed below. If you have access to a computer and a simple spreadsheet program (such as Microsoft's Excel) you can use that to keep track of your coin collection and all your purchase and sales information. This makes it easy to add and delete lines, sort your collection and the ability to instantly calculate the total value of your coin collection. Furthermore, you may decide to track additional information that other people may not be interested in tracking. You can do this by simply adding a column to your spreadsheet. You can create tabs for each one of your coin folders, albums, collections, etc. Name each tab the same as your collection title. This will make it easier for your heirs to match up your coin album with the spreadsheet which details what's inside of it. For example, if you have a Dansco Peace Silver Dollar album you may want to name your tab "Dansco Peace Silver Dollars." You can add running totals at the top or bottom of individual columns to keep track of the total value of your collection for that sheet. I would recommend putting the totals at the top of the columns so that as you add items to your collection at the bottom of the spreadsheet, you will not overwrite the totals functions in that particular cell. The fourth option and the best option is to purchase software written explicitly for coin collectors. There are many different options for coin cataloging software in the market today. Some are free, some are very low-priced ($20-$30), and some are a little bit more expensive. My experience in software has taught me that you get what you pay for. What you should look for in coin cataloging software: ease-of-use, intuitively laid out screens, the ability to organize your collections the way you want, downloading of current pricing information and automatically re-valuing your coin collection at current market prices. The last and most important feature to look for is a fully functioning trial version or a money-back guarantee if you are not satisfied with your purchase. Of course, if you don't know how to protect, preserve and store your coin collection, it may be stolen by thieves or damaged by the environment which can decrease the value of your coin collection by a significant dollar amount.